With hefty majorities in both chambers of the state Legislature, Democrats say the time is ripe for a shift away from the material that has polluted waters and clogged recycling centers. Opponents question how much good the measures would do. OLYMPIA – As an Edmonds City Council member in 2009, Strom Peterson championed the city’s initiative to become the first municipality in Washington to ban plastic grocery bags. Ten years later, he’s the lead sponsor of a bill in the state Legislature to ban single-use plastic bags across the state. 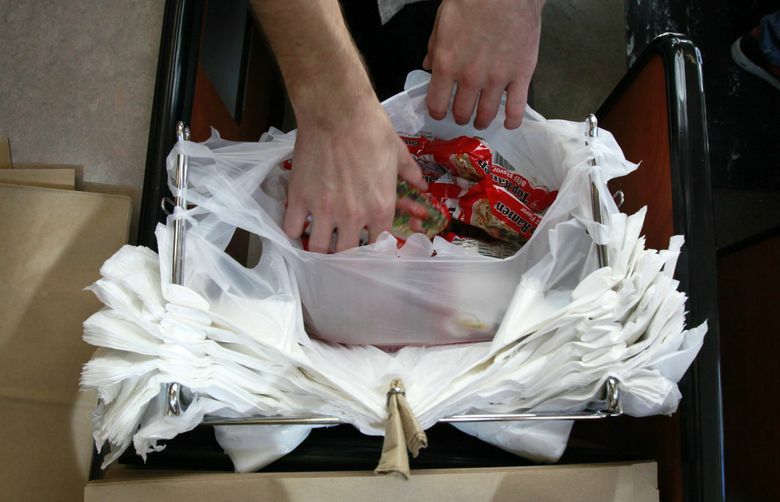 HB 1205, which is supported by the Washington Hospitality Association, would prohibit retail establishments from giving customers single-use plastic carryout bags, or paper bags that do not meet recycling requirements. With hefty majorities in both chambers of the Legislature, Democrats say the time is ripe for a shift away from the material that has polluted waters and clogged recycling centers. “Washington is going to be on the leading edge of reducing single-use plastics,” said now Rep. Strom Peterson, D-Edmonds. The single-use plastic bag ban is just one of several proposals being discussed in the legislative session that began Monday, including separate prohibitions on single-use plastic straws, utensils and plastic packaging, as lawmakers aim to make the environment a major talking point of 2019. Proponents of the measures are pushing them in hopes of reducing water pollution, which was cited by National Oceanic and Atmospheric Administration biologists as one of the problems ailing the endangered southern resident killer whales in Puget Sound. Todd Myers, the environmental director of the Washington Policy Center, disagrees that banning the material is the answer. “I understand why people think this is a feel-good proposal, but the simple fact is that it would do more harm than good, both in terms of energy and water quality,” Myers said, citing a Danish Environmental Protection Agency study that found that plastic bags, compared to other materials such as cotton, had the lowest impact on the environment. If the bill passes, Washington would become only the second state to ban single-use plastic bags after California took a similar step in November 2016 with a voter-approved proposition. Hawaii has a de facto ban since the state’s most populous counties prohibit bags that are not biodegradable. In California, plastic bags accounted for more than 7.4 percent of litter collected on beaches during the state’s 2010 Coastal Cleanup Day. That number dropped to 3.1 percent in 2017, down from 3.4 percent in 2016. Sen. Tim Sheldon, a Democrat from Potlatch who caucuses with Republicans and serves on the committee overseeing the bill, believes this legislation was hastily written and he does not support it, instead favoring education on recycling. He says it is being pushed to earn the support of urban dwellers, while ignoring rural residents. The bill, which is scheduled for a public hearing on Monday before the House Environment and Energy Committee, would be enforced on a complaint basis, and Peterson hopes it would bring compliance through education, instead of fines. Legislators last year pushed legislation that would have placed a small tax on consumers for plastic bags, but had no success. This year’s bill includes a 10-cent charge for every recycled-content paper bag provided to customers. Such bags would be available in stores to offset the costs of moving away from single-use plastic bags. Stores could also provide a reusable 4-millimeter plastic bag for the same fee. Meanwhile, lawmakers are also looking at a ban on single-use plastic straws with SB 5077. Retailers that violate the legislation would face a $25 per day fine after their third offense, which could total up to $300 per year. Seattle is believed to be the first major American city to ban single-use plastic straws, doing so in July 2018. And large companies, such as Starbucks, Disney and American Airlines, have already decided to phase out plastic straws in favor of paper straws. Even Peterson’s restaurant, the Cheesemonger’s Table in downtown Edmonds, moved away from plastic straws more than a year ago, he said. One factor supporters of the bill have had to take into account is the effect of a plastic-straw ban on people with disabilities, who rely on them over compostable straws. This was solved in Seattle by allowing flexible plastic straws to be provided to customers for medical reasons. The bill, which is set to have a public hearing on Thursday before the Senate Environment, Energy and Technology Committee, orders the state Department of Health and the Department of Social and Health Services to consult with stakeholders on how to address the need for plastic straws in health-care facilities and for individuals with disabilities. Rep. Joe Fitzgibbon, D-West Seattle, chair of the House Environment and Energy Committee, doesn’t think Washington is ready for a statewide ban on plastic straws. He believes that a bill that would allow them only upon request is more likely, much like a policy just enacted in California that prohibits sit-down restaurants from providing plastic straws unless customers explicitly ask for them. The American Chemistry Council, the lobbying arm of the plastics industry, said in a statement that “the most appropriate policy is to allow customers to request a straw when needed.” The council declined to comment on the proposed ban on single-use plastic bags. Fitzgibbon, who introduced legislation to regulate checkout bags as far back as 2011 with little success, feels that ban is more suitable for the state given the support of local governments, including the cities of Seattle and Tacoma, which have already approved prohibitions in recent years. Similarly, Northwest Grocery Association lobbyist Holly Chisa says the organization is in favor of a plastic-bag ban because it wants a statewide standard that would make it more consistent for both customers and employees. Kroger Co. has already begun voluntarily phasing out plastic bags at some Washington QFC stores, according to The Associated Press.